5 months. 5 months! 5 months?!? I know I have said it before but it bears repeating: this month has been awesome. And as a mama, I am at liberty to say that again and again if I so please. Eddy is discovering new talents all the time. He has figured out that he controls those cool little tentacle-like things attached to his hands - his fingers! They are excellent for grabbing toys, beards, and noses. He is also working on a few new consonant sounds, like "uh-buh" and "nuh" to add to his "coos" and "goos". I love that he spends all day watching bigger people make noises (talk) to each other and thinks, "Hey, I can do that!" Another very cool skill that he acquired this month: rolling over! While he was staring at his very own beautiful face in a mirror during tummy time, he managed to flip himself over. I reacted in a big way which startled and excited him at the same time. He is getting better and better at this skill everyday and it continues to amuse both of us every time. But my favorite thing that he started doing this month is really reacting to Lucy. As much as she hates when we leave, Lucy loves it when we come home. She squirms herself into the tightest curl and tip-toes all over the living room, wagging her Snicker bar tail furiously. This cracks him up. He starts reaching out for her and when we sit down to greet her, she approaches slowly to start kissing him and he just keeps on laughing. And it's a fantastic belly laugh. If we've been sitting in one room playing for a bit and Lucy walks in, he starts smiling excitedly and reaching out for her. It is so amazing to watch this relationship grow and change. So, five months. Cinco meses. A whole handful of digits. On our way to take this month's picture, Eddy faded into a nap just before pulling into the parking lot of Toy Joy. He was none too happy to be pulled out of his car seat but was quickly distracted by the flashy and sparkly objects hanging from the ceiling. 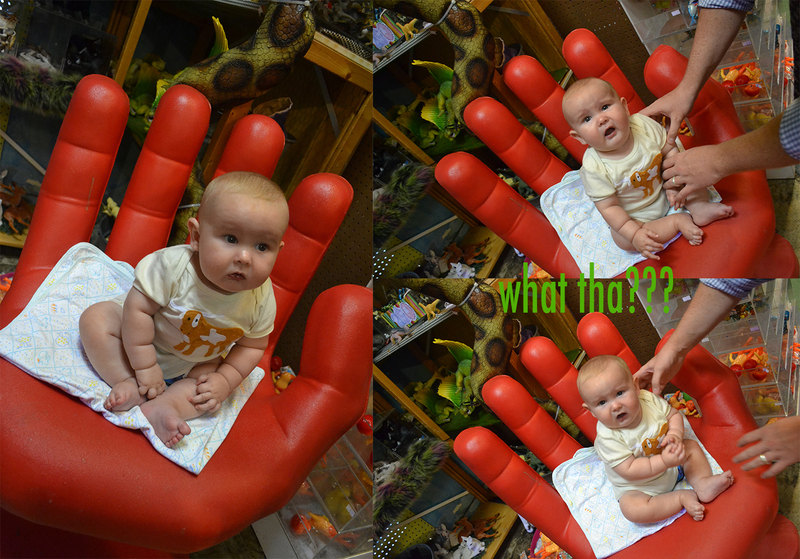 We snapped a few quick pictures in the hand chair - five fingers! - and boogied out to get our sleepy Ed to bed. All the way home, he chatted about everything he saw and asked if we could go back to that awesome place soon. You see that, folks? That is very nearly an unsupported sit! I am so in love with this kid. Oh, and he weighed in at a handsome, healthy 19 pounds 6 ounces during his 5 month doc's appointment. Will we break the 20 pound mark before 6 months? Eddy is a total boss! Can't believe all the cool stuff he's doing. I am so in love with Eddie. He DOES make everything better!